Head down the San Luis Pass Rd. toward the West End of the island and you will find a quaint little paradise known as Beachside Village in Galveston. Rows of cotton candy colored homes are nestled beachfront and form a perfect little community inspired by Old Galveston. The homes have the charm of Plantation and Victorian era architecture mixed with a modern Southern vibe. Tin roofs adorn each of these beautiful homes and oversized porches/patios allow you to enjoy amazing gulf breezes. Sip your first cup of coffee as the seagulls sing to you, relax and lookout over your ocean views to a perfect sunrise each morning. Take afternoon naps in a hammock while the waves lull you to sleep or have the perfect picnic for two on a private beach. The possibilities are endless and the relaxation you’ll experience here is priceless. Beachside Village is on the West side of Galveston, closer to the local crowd and further away from tourist hot spots like Pleasure Pier, The Strand and Galveston Seawall. This is a perfect location because it is close enough to enjoy all the shops, restaurants and amenities of the island but you’re far enough away that you avoid all the traffic and noise. The West end of the island does offer easy access to Moody Gardens, Schlitterbahn and some outstanding fishing. 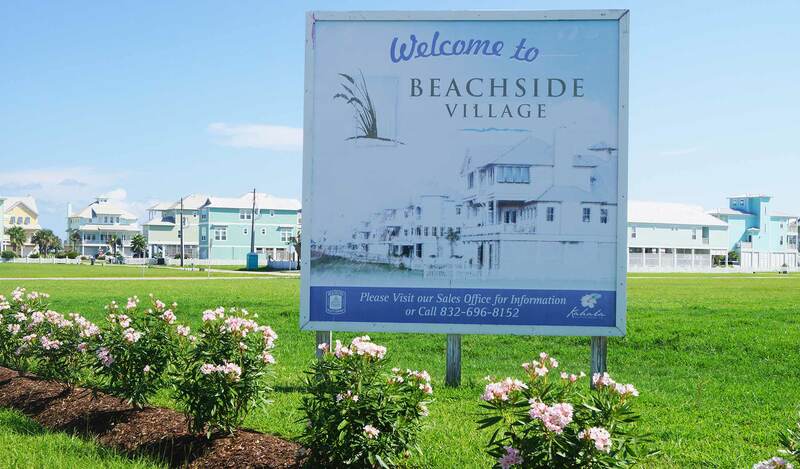 Beachside Village in Galveston is still under development but there are plans in place to expand the community feel within the neighborhood and rendering plans for a chapel, more greenery and even condominiums. This village is perfect for families looking to enjoy a welcomed vacation or splurge on an extended stay. The attention to detail and comforts of home will make it hard to leave this Galveston Island getaway. The West end of the island offers easy access to some great attractions near our Galveston beach house rentals. Moody Gardens is a family entertainment center that offers so many activities, you won’t know where to begin! Animal lovers will want to check out the amazing Aquarium Pyramid, a 1.5-million-gallon aquarium habitat featuring penguins, sharks, stingrays, and more, as well as the Rainforest Pyramid, where you can visit Giant River Otters, monkeys, and rare plants. But Moody Gardens is more than a zoo/aquarium: it’s also an action-packed hands-on museum! Kids will love the interactive exhibits in the Discovery Pyramid, as well as the awesome 3D and 4D movie offerings. If your kids need to burn off even more energy, take them to the Ropes Course and Zipline, where they can test their strength and skills while having loads of fun. Don’t worry, it’s not only for the kids! Moody Gardens also offers some great adult entertainment. Enjoy a relaxing sunset dinner cruise aboard a replica of a 1800s paddlewheel boat. And of course, Moody Gardens is well known for its golf course, for which you can conveniently book your tee time online. The popular Schlitterbahn water park is also conveniently accessible from Beachside Village, and you will definitely want to spend a day barreling down its famous waterslides! Those who prefer to relax while the kids do the screaming can enjoy floating in an inner tube down Torrent River, or just lounging around the swim-up bar in the Wasserfest Heated Pool. These Galveston beach house rentals are also convenient for some top-notch fishing. Galveston is, of course, a renowned fishing destination, and whether you prefer to fish from the pier or boat, you have so many options here. The island’s extensive system of piers and jetties offers anglers a chance to catch croaker, perch, speckled trout, sheepshead, sand trout, gafftop, bull reds, and more. Fishing on the Galveston Bay side of the island offers calmer waters than the Gulf, and opportunities to go out on smaller boats. And of course, deep-water fishing in the Gulf and open ocean is unbeatable! Charter a boat for your golden opportunity to catch that prize marlin or tuna you’ve been dreaming about. Beachside Village in Galveston is a brand-new community which has been designed to create a community feeling, with amenities like pedestrian paths. While still under development, there are plans in place to add a chapel, more greenery, and even condominiums. This village is perfect for families looking to enjoy a welcomed vacation or splurge on an extended stay. The attention to detail and comforts of home will make it hard to leave this Galveston Island getaway.